Ninth-century Europe. Johanna (Johanna Wokalek) grows up in Ingelheim am Rhein. The daughter of the dogmatic and doctrinaire village priest, against her father’s will, she learns to read and write in secret. Her extraordinary talent is discovered and she is allowed, the only girl, to attend the cathedral school in Dorstadt and is given into the care of the knight Gerold (David Wenham), with whom she falls undyingly in love. 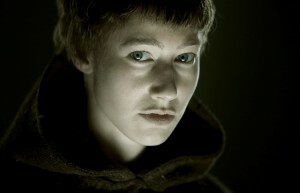 Following a bloody attack by Normans, Johanna disguises herself as a man and enters the monastery at Fulda. There, she learns the art of healing and is ordained. Later, in Rome, she gains a reputation as a healer and becomes the personal physician of Pope Sergius (John Goodman). Shortly afterwards, he is found poisoned. The leader of the conspiracy, Bishop Anastasius, hopes himself to ascend the throne, instead it is Johanna who is elected pope. But the undiscovered “popess” has a dangerous weak point: she is pregnant by Gerold, her secret lover. Johanna Wokalek (“my absolute casting wish”, director Soenke Wortmann says) has steadily made her way to the front ranks of German actors, and is set to push her way even further forward with Die Paepstin (“Pope Joan”). She is currently in The Baader Meinhof Complex and North Face, although she can already count several accolades as her own, including the Bavarian Film Award 2003 for Hierankl and an Adolf Grimme Award in Gold (2006). Australian David Wenham, as Gerold, is one of those familiar faces you might not have been able to put a name to in the past. But his credits are extensive: Moulin Rouge, The Lord of the Rings: The Two Towers, The Lord of the Rings: The Return of the King, Married Life and 300. He also features in Baz Luhrmann’s epic Australia. John Goodman (Pope Segelius) may still be best known for his role of Dan in the sitcom Roseanne, but he is also capable of far more, as anyone who has seen his very dramatic turns in Barton Fink, Raising Arizona, The Big Lebowski and O Brother, Where Art Thou? can testify. Director and co-writer Soenke Wortmann is one of the big names in contemporary German cinema, winning the German Film Award for Kleine Haie (1992), while his Maybe, Maybe Not (1994) was the most successful German film of the 1990s, selling more than six and half million tickets. Wortmann’s football melodrama, The Miracle of Bern, attracted more than 3.6 million spectators and his 2006 Football World Cup documentary, Deutschland. Ein Sommermaerchen, is the country’s most successful documentary. Martin Moszkowicz, head of production at Constantin Film, has well more than 100 feature films to his credit, including the 2003 Oscar-winning Nowhere in Africa, as well as Manitou’s Shoe, Resident Evil, Perfume, The Wave and The Baader Meinhof Complex. Although “aimed principally at a female audience” (Moszkowicz), Die Paepstin, with its choice casting and eye for historical detail, is bound to appeal to males as well.